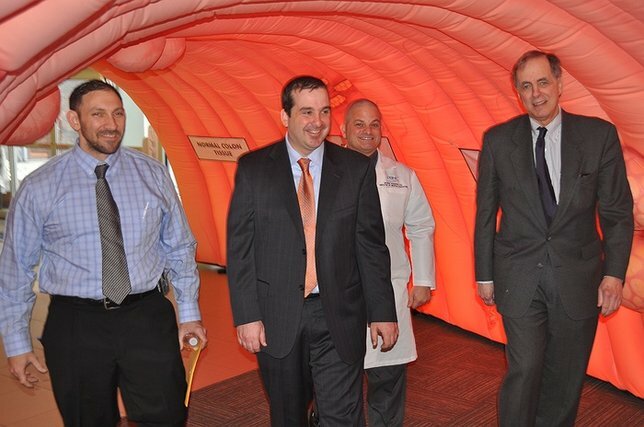 Pictured L to R: Dr. Brett Ruffo, Dr. Mark Coronel, Dr. George Ruggiero, Dr. James Tomarken walking through the ten foot tall inflatable colon educational exhibit. Riverhead, NY - March 7th, 2016 - Suffolk County Health Commissioner, Dr. James Tomarken signed a pledge with Peconic Bay Medical Center today to reach a shared goal of 80% screened for colorectal cancer by 2018. Colorectal Cancer is a leading cause of cancer-related deaths among men and women in the United States. Each year in New York State, more than 10,000 people develop colorectal cancer and more than 3,500 New Yorkers die from the disease. Screening helps save lives. Today, Peconic Bay Medical Center, Northwell Health had tour guides, Dr. Brett Ruffo & Dr. Mark Coronel show the community what it’s like to walk through the ten foot tall inflatable colon. They discussed possible diseases that could form, what polyps looked like, and educated the community of the importance of screenings and how this particular cancer could be preventable with early detection. This is a month to bring awareness. Earlier in the week, to kick off colorectal cancer awareness month, Town Supervisor Sean Walters signed a proclamation declaring March 2016 Colorectal Cancer Awareness Month in the Town of Riverhead. To raise awareness about Colorectal Cancer, Peconic Bay Medical Center, Northwell Health and The Cancer Services Program of Suffolk County encouraged businesses to participate in Main Streets Go Blue campaign. In partnership with the Cancer Services Program, individuals and organizations will share information with the public, decorate their shops and streets in blue, run blue sales and specials, and host colorectal cancer screening events throughout March. The street lamps wrapped with blue ribbons along Main Street, remind the community of the importance of getting screened. The Cancer Services Program of Suffolk County offers colorectal, breast and cervical cancer screening to eligible uninsured individuals. All men and women 50 and older are encouraged to begin colorectal screenings. To find out eligibility with Cancer Services of Suffolk County contact 631-548-6320 or visit their website. More information about colorectal cancer can be found on the DOH website here. PBMC Health is a comprehensive continuum of care focused on serving the full range of health and wellness needs of the people of Suffolk County. Anchored by Peconic Bay Medical Center, the continuum includes Urgent and Walk-In Care services at locations throughout our service area; Peconic Bay Home Health Services, serving all of Suffolk County. Peconic Bay Skilled Nursing & Rehabilitation, located in Riverhead; Peconic Bay Outpatient Physical Therapy, located in Riverhead; Peconic Bay Primary & Family Care Practices, with offices in Center Moriches, Hampton Bays, Manorville, Mattituck, Riverhead, Shoreham and Westhampton Beach; and a range of primary care, diagnostic and specialist services at the Gertrude and Louis Feil Campus for Ambulatory Care in Manorville. For more information, visit PBMC Health online. Peconic Bay Medical Center is a non-profit medical facility committed to providing exceptional care and improving the health of the communities it serves. Peconic Bay Medical Center offers wide ranging, full-scope services and programs along with state-of-the-art technology. Peconic Bay Medical Center and PBMC Health officially joined Northwell Health, formerly North Shore-LIJ becoming the East End’s hub for the world-class resources of New York’s largest health care system. For more information, visit PBMC Health online. Northwell Health is New York State's largest health care provider and private employer. With 21 hospitals and nearly 450 outpatient practices, we serve 8 million people in the metro New York and beyond. Our 61,000 employees work to change health care for the better. We're making breakthroughs in medicine at the Feinstein Institute. We're training the next generation of medical professionals at the visionary Hofstra Northwell School of Medicine and the School of Graduate Nursing and Physician Assistant Studies. And we offer health insurance through CareConnect. For information on our services in more than 100 medical specialties, visit Northwell Health online. Subject: LongIsland.com - Your Name sent you Article details of "Suffolk County Health Commissioner Dr. James Tomarken Signs Pledge to Fight Colorectal Cancer"